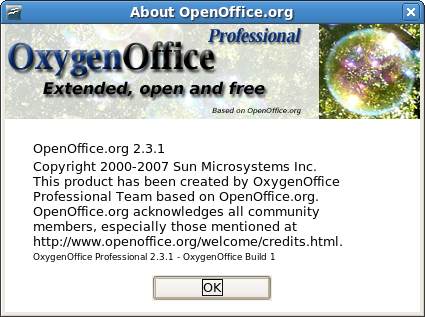 On Fedora 7 (and maybe some other Linux systems), OxygenOffice 2.3.1 may require a little hack to get it to start. Download OxygenOffice Professional. I chose version 2.3.1 English. Uninstall any previous OpenOffice.org: sudo yum remove "openoffice*"
(optional) Delete any packages you do not want installed. For example, you may wish to delete the fonts, onlineupdate, or math packages. (optional) Prevent yum from upgrading OxygenOffice to Fedora's OpenOffice.org: su -c "echo exclude=openoffice*>>/etc/yum.conf" If you already have excluded packages, you'll need to use an editor instead of this command. (optional) Remove Fedora's Java and install the Sun Microsystem Java Runtime Environment. If you wish, enable the quickstarter in Tools > Options > OpenOffice.org > Memory. Check the box Enable systray Quickstarter. With your suggestion i have solved the libxml2 problem on Fedora6. But one more problem remains. ie. no suitable windowing system found, exiting. What should i do? Pl. help.